I have been asked by the team preparing my nomination to tell this story. More than a decade ago, I met Noel Dunne. 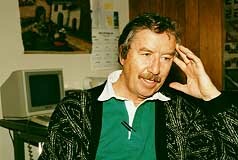 He was an Irish former Catholic priest who had worked for many years as a missionary among the Indians of Peru and Chile. There he learned Spanish and helped these Indians create economic cooperatives to sell their pottery. He then married and came to Denver, where, because of his commitment to the poor and his mastery of Spanish, he was recruited by the Christian Community Services to work in Alamosa, the central town of 30 very small towns, in Colorado's San Luis Valley. Several years earlier I had been doing pro-bono work in the San Luis Valley from time to time, using advanced techniques to connect up at the lowest possible cost, some very poor school districts there to the Internet. Noel Dunne heard about that and looked me up. He had an idea that somehow, some way, computer communications could help support the work of CCS helping the poor in the most rural of areas of the valley. The San Luis Valley is 100 miles long, 50 wide, surrounded by the 14,000 foot Sangre de Cristo and Rio Grande mountain ranges, a giant flat ancient lake bed with the head waters of the Rio Grande River running through it en route 1,500 miles to the Gulf of Mexico. It has been homesteaded since the 1600s by migrating Spanish, then Spanish-Americans, then Hispanics. This magical valley is home to some 35,000 rural folk in 30 small agricultural communities in 16 separate small school districts. An often desperately poor, devout, people, isolated from even the most rural Catholic churches and ordained priests, they had rich inner lives, vivid art, an ancient religion-centered culture, beautiful churches -- all against the backdrop of some of the most magnificent mountain peaks in the nation. With 80% Spanish speaking and 20% Anglo in the southern end of the valley and the reverse in the north, they were a cultural, political, economic, educational, and technological challenge. Earlier I had successfully linked some schools to the Internet through Adams State College servers. And at one of the poorest schools in central Colorado I had hooked up the first wireless devices (using some modems never built for what I used them for) between a classroom and a server in the building. (Somehow, this had caught the attention of Tom Kalil, Vice President Gore's technical advisor, who then told the FCC they needed to talk to me). So Noel Dunne asked me to work with him to create computer bulletin-board technology that these valley people -- immigrant families, white farmer-exploited migrant workers, the simply poor -- could use to communicate with each other. 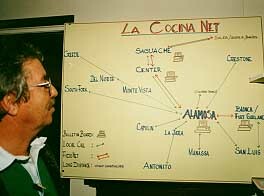 I helped him create a dial-up modem, local network called "La Cocina" -- the Kitchen, where in Hispanic homes the important conversations take place. 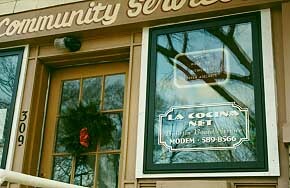 La Cocina's bulletin board informed these people about housing, the education of their children, and legal representation. It went on to provide (Noel Dunne's own specialty) self help for very small businesses and income producing activities, and the web based marketing of some of their products, like weaving. Cooperative marketing allowed them to get better prices for their handicrafts. I then got Noel Dunne together with an interesting woman dedicated to online education, Carmen Gonzales, and another incredible man -- a Professor Tomas Atencio then at New Mexico University who had a brilliant thesis called "Resolana." Resolana was the ancient Hispanic "way of knowing" in which the men of the tiny towns towns sat on the sunny side of the plaza and, through oral dialogue, formed and perpetuated the values, knowledge, and wisdom of the village (unlike the European/North American "way of knowing" through academic study, science, and printing). Professor Atencio believed that unless traditional Hispanics, such as those in Northern New Mexico, learned the new technologies and used modern communications to replicate this way of knowing, they would simply become the information-sweatshop workers of the 21st Century and lose their ancient culture while gaining the middle class -- a prospect that bothers Hispanics profoundly. So, when Professor Atencio saw that I had created an all-purpose computer language with which people could communicate both linguistically and artistically (so that symbols could be sent back and forth, but that's another story), he said this was the technology he had been looking for for years. We formed a movement called "Resolana Electronica." It flourished for a few years until the rise of the Norte Americana World Wide Web brought the crass values of American TV and print magazines to the Internet, and lured the Hispanic children away from their gentle but profound "la familia" and resolana-centered community roots. I donated $10,000 -- $5,000 to help La Cocina get started, then later $5,000 to Tomas Atencio to help get La Resolana Electronica get going. The latter was a community communications server housed at the University of New Mexico which was linked to small systems and modems in small Hispanic communities and Indian pueblos in Northern New Mexico. They couldn't afford it themselves. I offer this vignette to provide up close and personal evidence of my sometimes successful (sometimes not) efforts to assist the poorest, and most rural, and minority-culture areas of the country with grass roots telecommunications. In this case it was the very depressed San Luis Valley, with two of the lowest per capita income counties in the nation.